Flipping a property can be a gamble, not only do you have to find a good deal, but you have to complete the rehab in a timely manner, relist the property and find the perfect buyer. Having a good team, behind your flipping business is an understatement — you’ll need a contract, real estate agent, lender, attorney and of course a home stager. 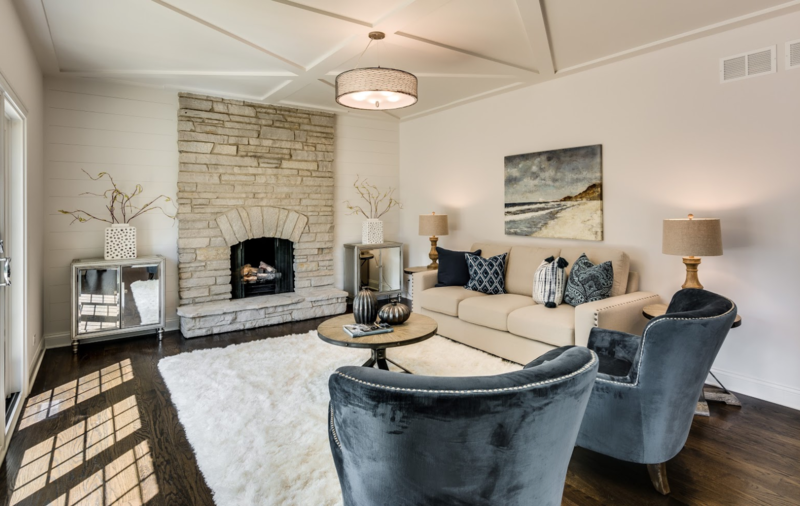 At Chicagoland Home Staging we will help secure a buyer quickly, by strategically planning the property’s aesthetics. We showcase the property by bringing in on-trend furniture and accessories that will help buyers visualize living in the property. Prior to the renovation, this 6-bedroom, 6-bath home on 5th Street in Hinsdale needed some TLC. The exterior of the home was painted white and gray to mask the old red brick, while inside the traditional dark finishes and yellow color pallet went neutral to appeal to neighborhood buyers. The home’s demographic will likely be a buyer that’s looking for a modern twist on traditional design. This is the living room (pictured below) before we brought in luxurious modern furniture with a transitional flair. 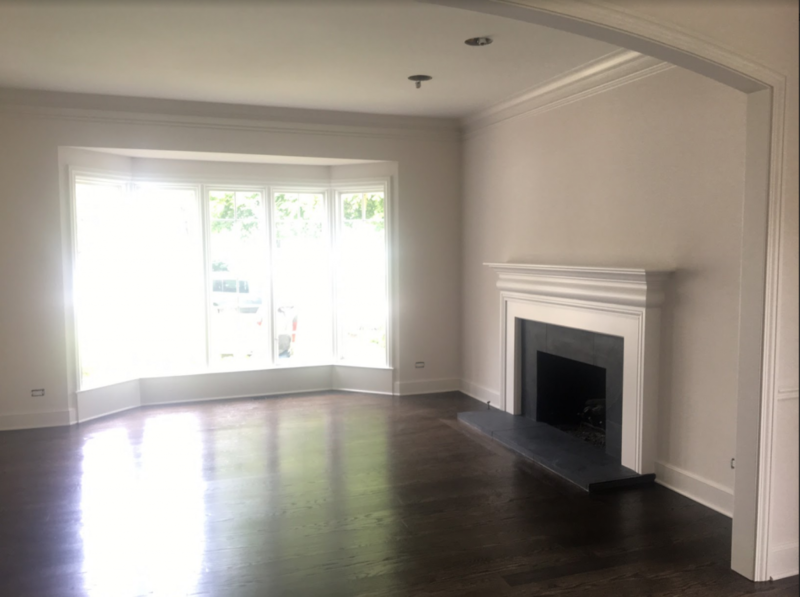 Our team wanted to keep the color palette light and airy so we went with neutral tones throughout the furniture and decor to highlight this room’s main features: the fireplace and large bay window. In the home staging transformation, our team played with symmetry inside this room to add balance to the design, notice the mantle, throw pillows and side tables. When elements are the same on both sides of an axis, the design feels more harmonious. We also used glass tables verse wood ones to reflect the natural light around the room and keep the space light and open, we didn’t want them to compete with the gorgeous dark wood flooring. Connected to this updated modern living room was a space for dining, before following through to the kitchen. Rather than close off the two rooms with the sofa, positioned with its back towards the dining room, we used club chairs to define the two seating areas. 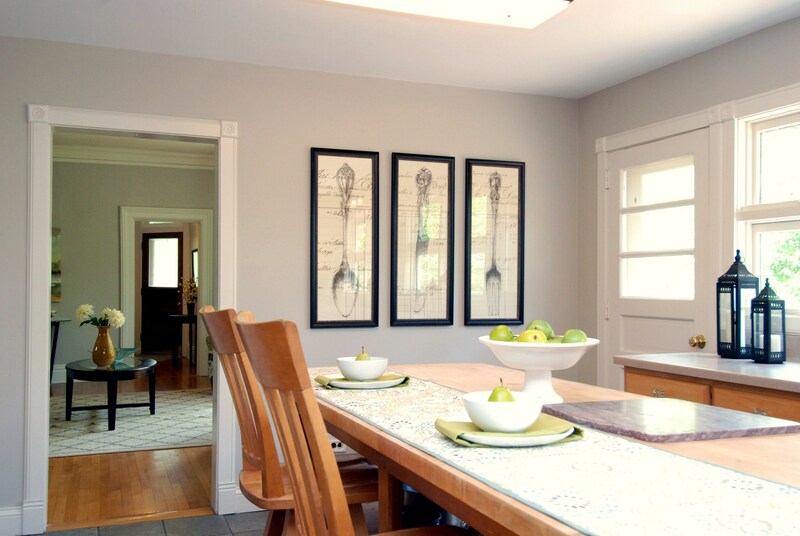 The living room, dining room, and kitchen all need to create one cohesive look and feel. The chic dining space was in dire need of definition. Our team started with a designer chandelier, then continued the symmetrical style and neutral tones from the living room into this space. We decided against head chairs at the dining table to enhance the traffic flow from the living room to the gourmet kitchen with breakfast bar. 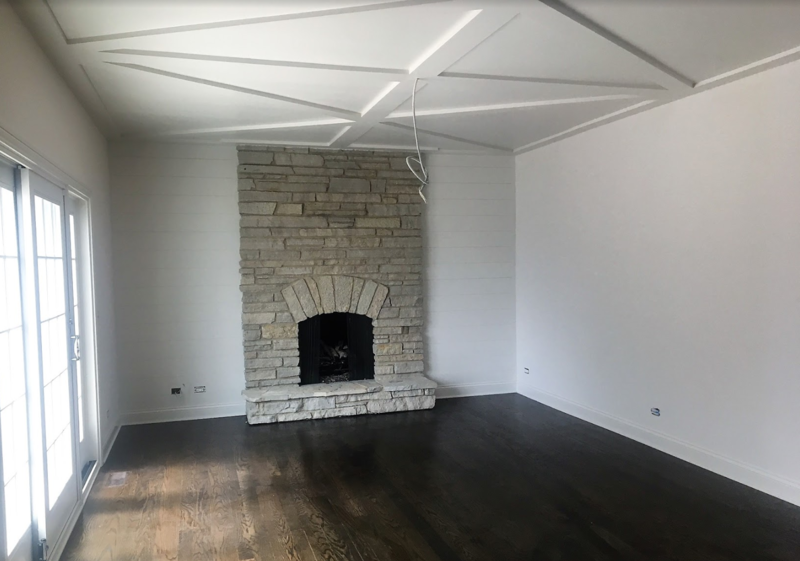 This property also had a family room that had some amazing features a stone fireplace, shiplap paneling, sliding french doors, and a dramatic ceiling. However, despite all these positive features, this room was still showing small for a family to relax in. That is until our team brought in the right furniture and accessories. We anchored the room with a furry white rug and used neutral tones with a pop of navy to create a comfy setting for spending quality time with loved ones. Again, we chose reflective surfaces and symmetry to define this space. We even added playful, patterned throw pillows to make this room feel less formal. 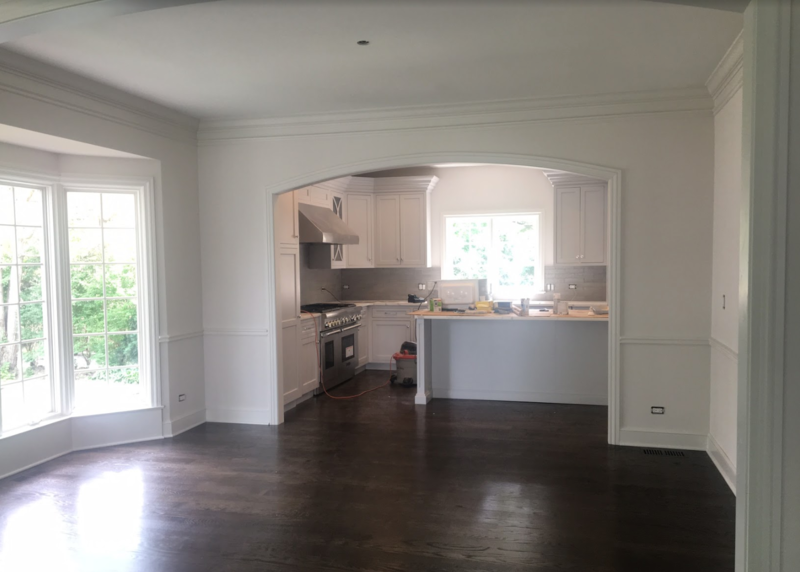 Many rehabbers may feel home renovations alone should sell a home, but as you can see home staging brings out the best features in those home renovations to present a premium product on the market that buyers are willing to pay more for. If you’re an investor and want to learn more about our staging services feel free to contact us today for a quote. Share our home staging blog!